“Havana Darkness” wastes a promising setting by an awful lot of poorly executed scenes, chops of acting and unconvincing horror cliches. Carlos (Guillermo Ivan, who also directed and co-wrote the film) plans to conduct research on Ernest Hemingway and when a chance to a Cuban getaway appears, he invites his friends to join him on a trip. Following the notes he secretly purchased in a bookstore back in the U.S., the three people soon find themselves trapped in what seems to be a disturbing game of manhunt. 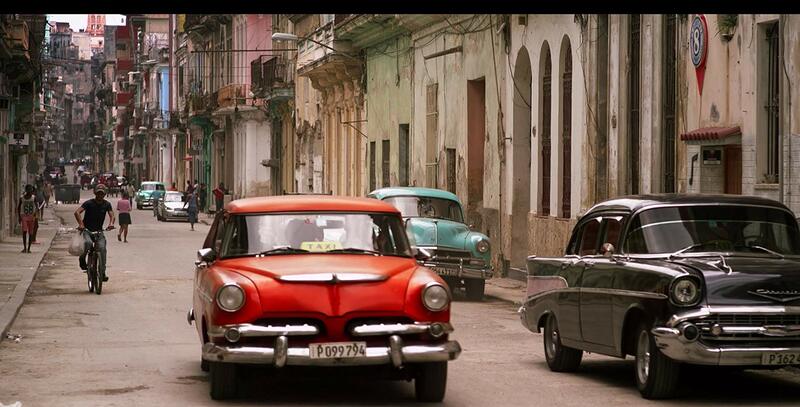 The Cuban capital city hasn’t been widely explored in the world of cinema. The country’s isolation from external influences kept it preserved in a form that winds the clock back by fifty years. Naturally, this creates an inspiring, diverse setting for any visionary filmmaker to visit. While Havana is a stirring place itself, “Havana Darkness” washes off every trace of its uniqueness with the most lackluster location shots imaginable. Guillermo Ivan, the renaissance man who directs, co-wrote and stars in “Havana Darkness”, uses the Cuban setting to tell the most conspicuous story he could sketch. Havana’s soul is lost and reduced to views straight from a Discovery Channel documentary feature. Frankly, it could be shot in Ohio too, with a probably similar outcome. The book that Carlos purchases is an unfinished manuscript of Hemingway, but also – a secret omen of death. The plot progresses by shots of Carlos strolling around, asking about the dark places mentioned in the notes. At the same time, the director fills the blank points in the script with a dire motive of Carlos’ friends getting engaged. As a result, the love birds want a romantic trip, while their friend is getting all weird and ruins their lovely time together with some creepy stories. Eventually, the three enter old mansion, that seems to be long forgotten and uninhabited (it’s a result of an awkward argument between them). As a former visitor to Cuba myself, I found that part somehow interesting – the Cuban suburbs are, indeed, filled with abandoned, often ruined houses, which might hide some very dark secrets if you think about it. Again, it’s a great setting. However, nobody in “Havana Darkness” is interested in piling up mysteries or creating a dense atmosphere. After a muddled half an hour of poor introduction, the manhunt is on, with few killers in over-the-top masks, machetes, crossbows and a guy speaking over the speaker. Call it a clumsy rip-off from “Saw” mixed with “The Purge”. Nothing that’s developed in “Havana Darkness” is particularly entertaining, not even for the die-hard fans of slashers. You have to withstand a lot of uncomfortably icky dialogues, along with mediocre acting, just to be served an under-cooked portion of cheap, predictable thrills and an ending that left me baffled by its absurdity. As a Cuban himself, Guillermo Ivan might have had a shot at using the mysterious mist surrounding Havana and turning it into a grisly piece of exotic horror. Given his origins, he had a natural advantage here. But more often than not, “Havana Darkness” enumerates examples of poor execution and plot decisions that make little sense. Want to read more about horror movies? Click here.